As much as we all wish we could take a super long vacation every year, the chances are that most of us do not. 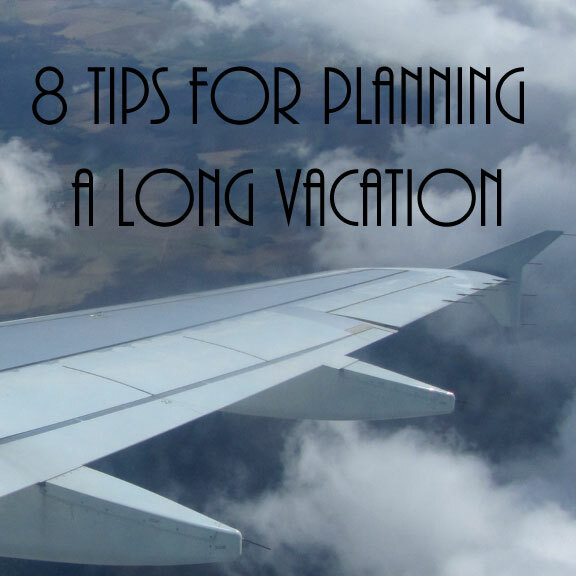 So even though we may be really good at planning those weekend getaways, we are not always experts when trying to organize that once in a blue moon long trip we take. I have been lucky enough to take a pretty long vacation on more than one occasion. I always have an excellent time and everyone on the trip usually does as well. We have also realized that we do a lot on those vacations, see a lot of things, and really get to experience the places we are in. After my first trip to Europe we came back and spoke with other friends and relatives who had been and my brother and I realized we did sooooo much more on our trip than most everyone else we had talked to did on theirs. We spent a month in Europe that first time, but just comparing how many days we spent in a city to others who had spent the same amount of time and sometimes more, we really maximized our time and what we saw on the trip so much better. So today I am going to share with you a few tips on how we plan for our big trips. Noah and I just used these when planning the 3 weeks we spent in Europe and it is well worth it. Plan, Plan, Plan – I know it’s a lot of work, but I cannot stress it enough. The only way the rest of our tips will work is if you make the commitment to planning the trip from the beginning. This is a long and time consuming process, but well worth it in the end. Do your research – make sure to research where you are going, the sites you want to see, and the surrounding areas to see if you have time for a day trip outside your main destination. Look things up online, get a guide book. We used Rick Steve’s guidebooks for both trips we took to Europe and they are packed full of valuable information, especially if this is a new destination for you. Make lists – List out the cities you want to visit and the sites you want to see by city. Take all that research you have done from multiple different places and condense it into one spot that you can look at, at a glance. Get a notebook that is specifically for planning your trip and begin making lists there. This way everything is in one place. You may have guidebooks and maps spread all over the floor by your computer, but your list the most important things for you to see should be all in one place and easy to read and find. Check for Closures – This is where those guide books I mentioned come in handy. Not everything is open every day. Research where you want to go, check what days those places are closed. While you do this be sure to write down the hours that the sites are open. Some places stay open late on one night a week. Be sure to note this. For example, in Paris, the Louvre stayed open till 9:00pm one night. This allowed us to see part of it in the morning, go see a few more sites before they closed and then go back and finish walking through parts of the Louvre at night once the other sites had closed their doors. It will really help you plan out where to go and when to maximize your time. The guidebooks even tell you which days are busier and when there will be less people. Make an Itinerary – This is a key item. This way you can take all that prep you just did in the first 4 steps and use it to make a well thought out plan for what to do when. This is key to not wasting time. If you have things planned out ahead of time you know what you need to do and when. This will allow you to be up early and at museums when they open to avoid long lines, or let you know when you need to be somewhere so you can figure out what time you have to leave your hotel to get there. You will see so much more by planning in advance. The amount of time that can be wasted while trying to figure out what to do next is amazing. We had a several page itinerary for our recent European trip and we wouldn’t do it any other way. It made for a stress free way to travel. Plan your free time – I know it sounds weird to say plan free time, but it works. We had days in cities where we just wanted to get lost, explore, and see what we discovered. That is most certainly something you need to do when in a new place. It is the best way to really see what life is like, take some time to relax, and just go with the flow. We chose days to do this when planning and worked them into our itinerary. By doing this we were still able to see all the things we had hoped to see on the trip and then had all kinds of fun surprises on our unplanned explore the city days. Plan some nighttime activities – But do not plan every night you are on the trip. A lot of times when we plan for a vacation we fill our days with things to do and then are left wondering what to do at night or too tired to do anything. For places we only spent a few nights we left our plans open to do whatever we discovered, but we made sure to get out at night and experience the city at night. Some cities are even more gorgeous all lit up so be sure to get out and see that. In places we had several nights we planned something for one or two of the nights and left the rest open for whatever we discovered. Plan some down time – Rest and relaxation is something that becomes much needed on a long trip. Unless the long trip is on the beach and you are relaxing all day every day, then you will eventually hit a wall and need to rest a little. Work this into your trip if you can. For example when we were in Europe we planned stops in a couple really small cities and a small village in the Alps with castles. A lot of times smaller towns like this are not filled with a lot of nightlife. That makes it much less tempting to go out and stay up super late. You can relax in your room for a bit at night, or like we did on our balcony looking at a castle and then get to bed at a reasonable time. Just a couple good nights of sleep in the middle of your trip will have you recharged and ready to go for the rest of it.